As we recently discussed here on the LCN blog, video is a hot commodity. From mobile video to live-streaming and video chat, you would be hard-pressed to find a sector generating more marketing fervour than video. If you’ve been contemplating upping your video marketing game but have yet to do so, one intriguing option you might want to investigate is Blab. For those who have yet to discover it, Blab lets you live-stream multi-party video conversations in real-time. Up to four people can participate in an on-camera conversation, with hundreds more following along online. Combining both live-streaming and video chat, Blab lets audience members post questions and comments, allowing discussion participants to respond in real-time. While tools like Twitter’s Periscope let you live-stream one-sided broadcasts, Blab enables group discussion video broadcasts. If you’re contemplating how you could incorporate this powerful new platform into your social media marketing strategy, check out the following roundup of potential uses. We think you’ll be impressed by the potential of Blab as a major marketing tool. Hosting week in review discussions on Blab is an excellent way to highlight activities your followers might have missed. Review company blog posts and their associated comments, discuss conferences you attended during the past week, or even highlight challenges your business faced and how you overcame those challenges. Hosting roundtable discussions on Blab is a fabulous way to bring intriguing audio/video content to your audience. Host discussions with industry insiders in your market, have a group discussion amongst key players in your organisation, or discuss recent events impacting your industry. Focus on topics relevant to your customers and watch your follower count on Blab soar. If you’re already recording podcasts for your audience, why not consider broadcasting those recording sessions on Blab? Followers can still enjoy listening to your podcasts, but live-streaming those conversations on Blab adds a video layer that can significantly increase your audience size. Unless you’re recording your podcasts in your pajamas, why would you not want to increase your audience engagement opportunities with video? When your business launches a new product or service, consider announcing your launch via a live Blab broadcast. Discuss features with a member of your sales team, review the design process with one of your developers, or preview your launch strategy with a member of your marketing team. Using Blab for product launches not only brings a level of transparency to your company’s development process it also lets your followers feel like they’re part of an insider’s circle. The more invested customers are in your company’s success, the better chances they’ll be brand ambassadors helping spread word of your business to others in their network. 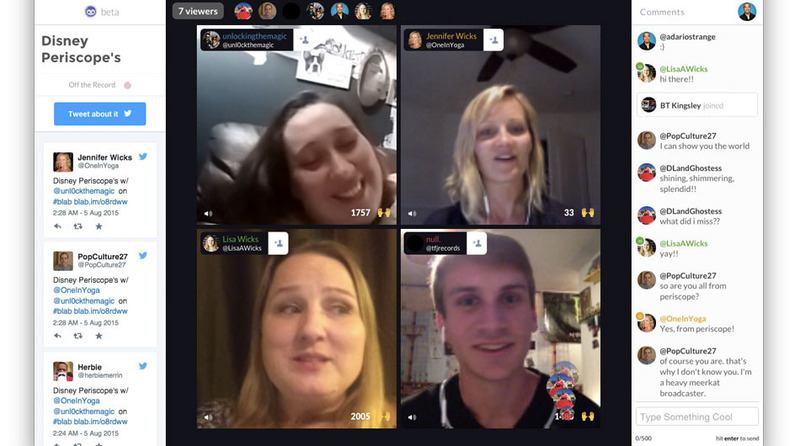 Consider using Blab to live-stream conversations with your customers. Discuss how your customer came to discover your company, what problem you’re solving for them, and successes they’ve enjoyed as a result of dealing with your business. Promote Blab spotlight opportunities via email subscriber contests. You don’t have to hunt for interview participants and you boost your email subscriber list at the same time. If your company participates in Twitter chats, consider integrating multi-host Blab chats into your Twitter chat activity. You can discuss relevant topics on Blab and post tidbits from your video conversations on Twitter. Not only are you contributing informative content to a Twitter chat conversation, you’re also drawing new viewers to your Blab broadcast from Twitter. The next time you attend a trade show or conference, consider live-streaming your attendance on Blab. Live-stream a discussion from your trade show booth, interview the conference organiser, or broadcast roving reporter discussions as you and your team move about the event. 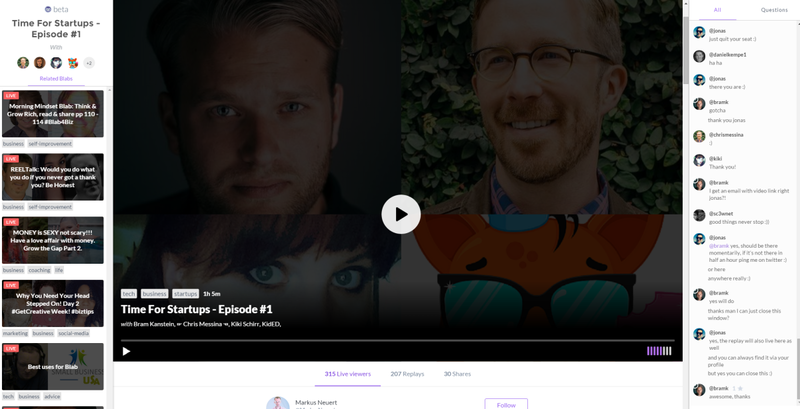 Speaking of interviewing, why not host one-on-one interviews on Blab? Read a good book your audience might enjoy? Interview the author on Blab. Notice an intriguing tidbit on Twitter? Host a Blab interview with your tweep. Blab lets both parties increase their audience engagement opportunities; securing interview subjects is likely to be an easy proposition. If you’re already posting motivational Monday content on Facebook or Twitter, consider hosting a motivational Monday Blab-cast. Broadcast motivational tips with your team, highlight actions you take to stay positive, or host discussions on motivational quotes you find particularly inspiring. Consider using Blab to answer some of the top questions your company receives from customers on Twitter and Facebook. Have members of your team participate in the Q & A discussion as you reveal the answers your audience is seeking. Customers can enjoy their question being spotlighted by your organisation and you get to pre-empt others asking the same question. Once you start brainstorming ways to use Blab to boost your brand, you’ll be amazed at the creative options you discover. Instead of automatically considering blogging about or tweeting on a particular subject, you’ll start to think of ways you can integrate topics into Blab broadcasts. The power and potential of Blab is undeniable. Have you used Blab yet? If so, how are you incorporating it into your brand-building strategy?